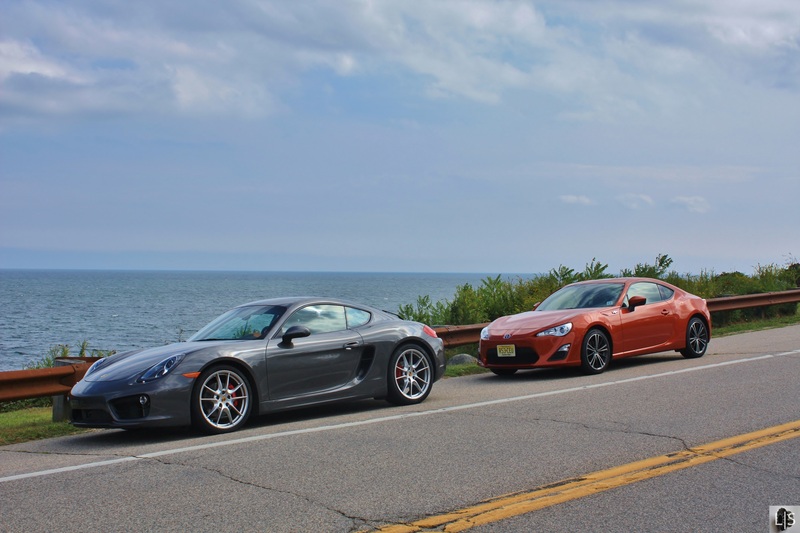 This Labor Day, we brought the Porsche Cayman S and the Scion FR-S together. 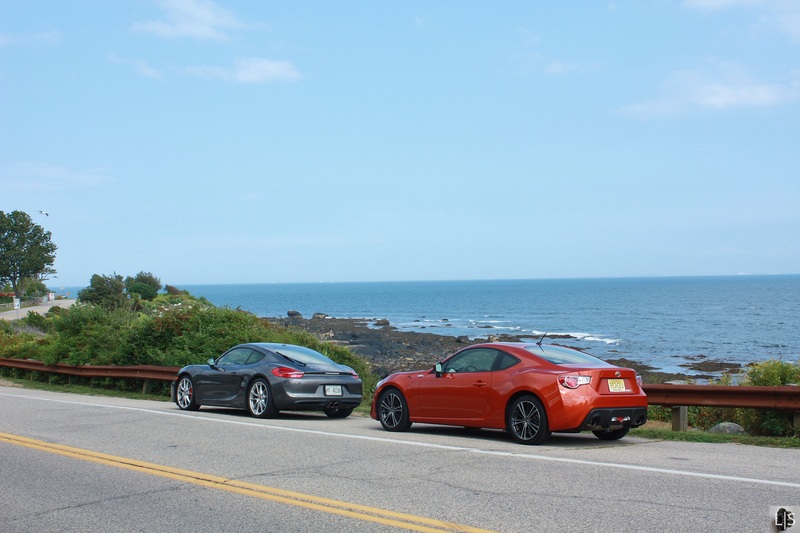 Our 700 mile trip to the New Hampshire coastline was a chance to examine both vehicles. Obviously, it wouldn’t be right to compare the two. At one end, the FR-S starts under $25,000. On the other, the Cayman S arrived with an options list more costly than the as-tested price of the FR-S. But if this isn’t a comparison, then what is it? When you look more closely, these two cars share the same purpose: driving. Both the Cayman S and FR-S are the enthusiast’s go-to choices. If you look at the lifetime of a single enthusiast, you have both the starter car and the ultimate goal. All wrapped up into a long-weekend road trip. A glance at both spec sheets reveal that each car goes about delivering on the goal of being an enthusiast machine in completely different ways. Admittedly, both platforms reap the benefits of the boxer engine, but in different places. The FR-S flat-four is where you would expect it, up front. The Cayman fits the flat-six between the axles. The FR-S is equipped with a traditional 6-speed manual while the Cayman S comes with the more advanced double-clutch gearbox. One approach is simplistic, classic, and raw. The other is more exotic and more technical. But in the progression of the enthusiast portfolio, that works. The FR-S forces you to learn the basics of car control. The key to being quick in the FR-S is to be smooth. The tires, shared with the Prius, give up easily which triggers traction control intervention. Driver’s aids slow the car down. In contrast, the Cayman S uses it’s technology to make the driver faster. On incredibly sticky summer tires, the Cayman S’ limits are incredibly high. Launch control, a torque vectoring rear differential, and the ability to shift instantly keep the power on the ground. The FR-S, with all driver’s aids disabled, provides a predictable platform for a new driver to experiment with. A Cayman S is most definitely faster with its tech than without it. We brought both cars down the main strip of the bustling Hampton Beach to gauge the reaction of the general public. The FR-S is clearly younger with its more outwardly-aggressive design. Being a new car, it has to be bold to assert itself to the public. It also helps to be Hot Lava orange. The Porsche is more subtle, with rounder and more suggestive curves. It’s a grown-up aggression, built from a performance family under the storied crest of Ferdinand Porsche. It has far less to prove. This shows up on the strip. At first, the attention falls to the Scion. What is that? Why is it orange? It looks like a sports car, but its unfamiliar to most onlookers. It also doesn’t have a sportscar soundtrack to back itself up. Then people notice the Porsche. It’s immediately identifiable as people turn and point, mouthing “Porsche” to fellow onlookers. Then they get an earful of the raspy bark emanating from the Cayman’s center split exhaust. Yes, that sounds more like it. For the younger demographic the Scion FR-S is eye-catching, but it isn’t the ultimate goal. No matter where you are in your life, a Porsche is almost always a dream car. It’s the pinnacle; the endgame for an enthusiast. The Cayman S is a poster you put on your wall while you have the FR-S in your garage. 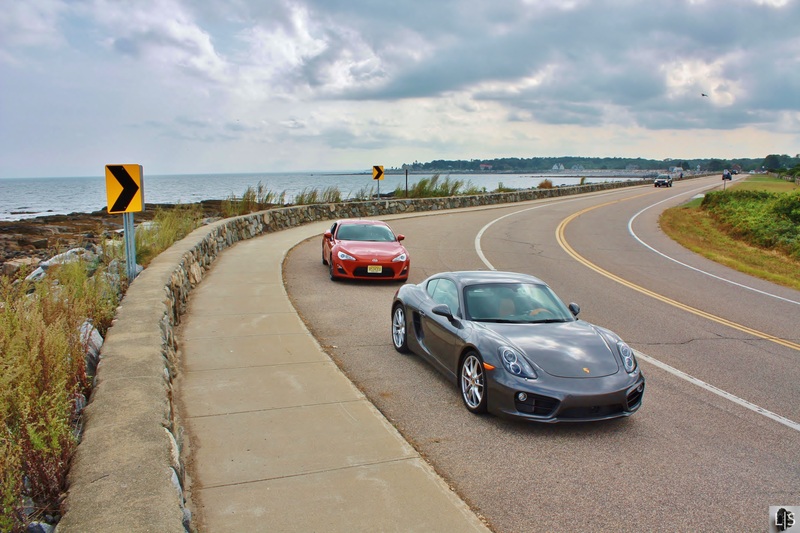 So here we have Alpha and Omega for enthusiasts: a starter car in the Scion FR-S and a dream car in the Porsche Cayman S. Back-to-back on the forested and undulated asphalt of New England, driving joy was found behind both wheels. For the younger enthusiasts, you can have the Porsche on the wall and the Scion in the garage and be able to sleep soundly at night knowing that you have a very good car. It might not be the complete package, but it doesn’t have to be. It’s everything you need in a driver’s car at a cost that won’t break the bank. If the day comes where you can have the Porsche on the wall and in the garage, then you will have made it. You’ll have the complete package. But never forget where you came from, knowing that you didn’t compromise as a young enthusiast. Your progression of car started and ended in the right place.